NEW: Mini Bunting Pattern now available! Not so long ago I mentioned that I had written a new pattern for some ever so sweet mini bunting. Well my pattern testers have been out with their red pens and the pattern is ready! I am so excited to be getting my first sewing pattern out in the big wide world…something I have been looking forwards to for some time. The pattern is available as a downloadable pdf from my pattern store on Craftsy. It features simple, clear and easy to follow instructions and a load of colour photographs to help you along the way. The great thing about this mini bunting (as if you need telling) is that it’s just so cute. Another great thing is that you can use up some of your fabric scraps (don’t pretend you don’t have any) or you can use it as a reason to buy some new fabrics just for the job (any excuse hey??). Either way, you’ll not need a lot of fabric as the little flags measure a dinky 6cm x 7cm. The Mini Bunting pattern is now available as a download from Craftsy at the great price of $6 which is just under £4. 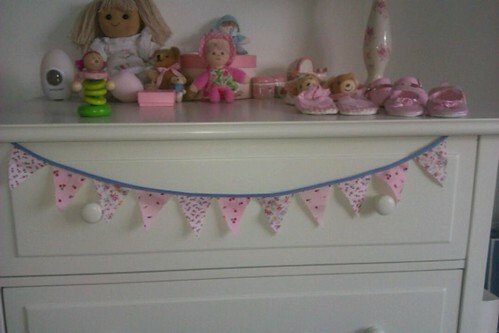 Surely no home is complete without some mini bunting!